Granary building at the LDS Church's Welfare Square in Salt Lake City, Utah. Welfare Square began in 1938 as a bishop's storehouse. Replica pioneer home and Bishop's Storehouse to the left. Stirling Agricultural Village, Alberta. The Newel K. Whitney Store in Kirtland, Ohio. A bishop's storehouse in The Church of Jesus Christ of Latter-day Saints (LDS Church) usually refers to a commodity resource center that is used by bishops (lay leaders of local congregations analogous to pastors or parish priests in other Christian denominations) of the church to provide goods to needy individuals. The storehouses stock basic foods and essential household items. The term can also be used figuratively to refer to all of the time, talents, skills, materials, compassion, and financial means of the members of the church that are available to be applied in the service of the needy. As of January 2010[update] there are 138 bishop's storehouses in operation. The concept of the bishop's storehouse is based on a revelation received by Joseph Smith, founder of the Latter Day Saint movement, on February 9, 1831, whereby he was instructed to keep goods "in my [the Lord's] storehouse, to administer to the poor and the needy". 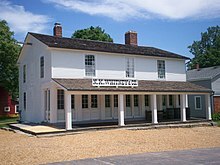 The first bishop's storehouse was established in Bishop Newel K. Whitney's store in Kirtland, Ohio. Most of the goods in the storehouse are purchased with fast offering funds or produced on church-owned agricultural property. The storehouses are staffed by volunteers or church service missionaries. Persons in need, whether members of the church or not, can access the storehouse by approaching a bishop or local Relief Society president. The bishop decides whether or not the person will be given assistance and works with the Relief Society president in determining what the person will be given. The usual practice is to ask the recipient to work or render some form of service in exchange for the good given them. Bishop's storehouses are not commercial entities and goods are generally not for sale to the public through them. There are buildings owned throughout the world that serve as bishop's storehouses. In areas of the world without a dedicated building, the bishop can render assistance by purchasing food and household necessities with church fast offering funds and delivering the goods to the recipient. This may also be done when the recipient has special dietary needs not catered to through the storehouse. The bishop can also draw on the "storehouse" of church members' available time, talents, and abilities to assist the needy. ^ Welfare Square entry in the Encyclopedia of Mormonism, 1992 ed., pgs 1558-9. ^ LDS Church (2004). Providing in the Lord's Way: A Leader's Guide to Welfare Archived June 27, 2008, at the Wayback Machine p. 8. ^ Doctrine and Covenants 42:33–34, 55. R. Quinn Gardner, "Bishop's storehouse" in Encyclopedia of Mormonism, pp. 123–125. Garza, Jennifer (2003-03-01), "Storehouse of Faith: For Mormons, being prepared for any emergency is nothing new", Sacramento Bee, archived from the original on 2003-08-04 . This page was last edited on 14 February 2019, at 21:07 (UTC).